7.30-9.00pm, Quaker Meeting House, Frodsham Street Chester, CH1 3LF. 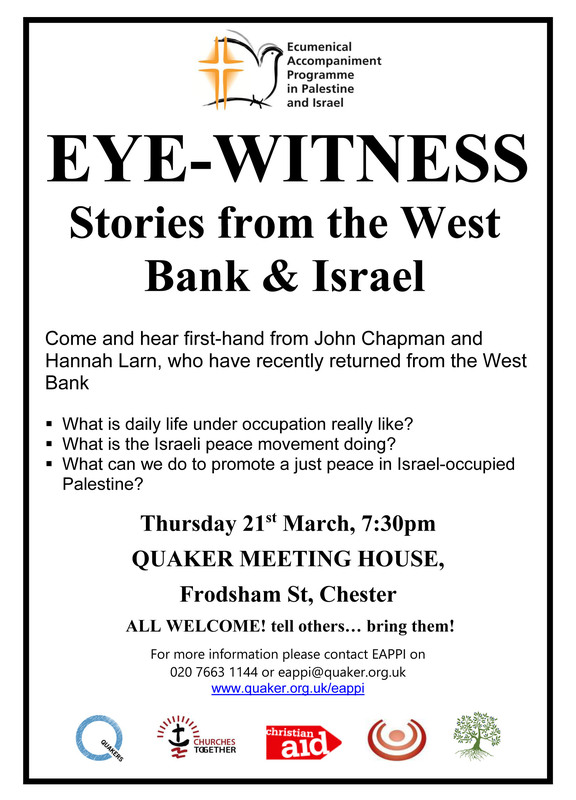 Come and hear first-hand from two recently-returned volunteers from the Quaker’s Ecumenical Accompaniment Programme in Palestine and Israel. What is daily life under the occupation really like? What is the Israeli peace movement doing? What can we do to promote a just peace in Israel-occupied Palestine? All welcome – please tell others! More information at www.quaker.org.uk/eappi or from 020 7663 1144.